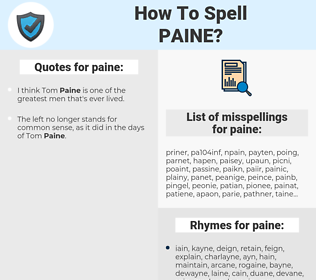 What are the misspellings for paine? What are the common mistypes for paine? What are the quotes for paine? What are the rhymes for paine? What are the translations for paine? 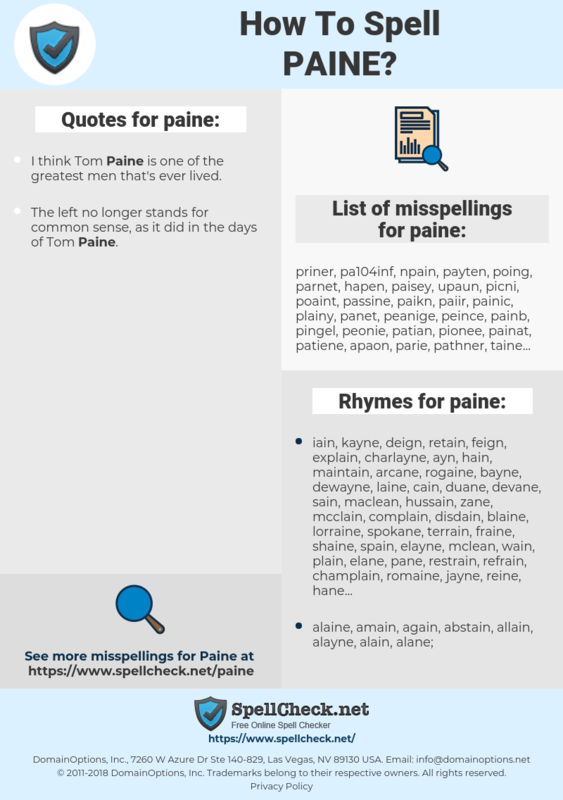 What are the common typos for paine? Paine as a girl's name (also used as boy's name Paine), is a variant of Payne (Latin), and the meaning of Paine is "countryman, rustic villager, peasant". This graph shows how "paine" have occurred between 1800 and 2008 in a corpus of English books. Well, if they will not march with Paine, they shall march under him. Also, an area that interests me- and it will probably take years to state what I mean- is the period of the rise of democracy, with Tom Paine, which is around the turn of the 18th century into the 19th.